So my readers today I’m reviewing Resonant Botanical’s Qi of Calm lotion. It’s a lotion made with a variety of different oils and plants to help naturally relieve anxiety, stress and insomnia. One of the main ingredients is 200mg of Hemp Oil Extract. Hemp oil alone can regenerate the skin’s protective layer and possibly prevent Psoriasis. For a full list of ingredients and why they were chosen to be in this lotion you can head on over to Resonant Botanical’s website here. This lotion though, is made with several different kinds of oils that will make your skin super soft. For optimal benefits of this lotion you’re supposed to apply it over your spleen, which would be on the left side of your stomach just below your last rib. As well as to the front of your throat and soles of your feet. 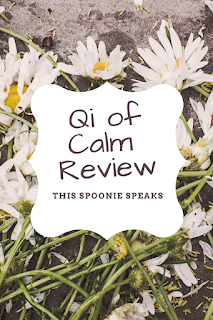 I started using Qi of Calm around the middle to end of August and my skin in all these areas has become super soft and more healthy in general. I actually have had success with using it to help with my Psoriasis as well as using it to calm me. And the reason why you apply Qi of Calm to your spleen area, front of your throat and bottoms of your feet because we have a lot of CB2 receptors in our spleens. A CB2 receptor or Cannabinoid Receptor Type 2 are acted on by the hemp oil. And there are a lot of acupressure points in the bottoms of your feet that help you calm down as you apply the lotion to the bottoms of your feet over a few minutes. The truth is I do have a lot of anxiety and PTSD related to various, incredibly painful events in my life. Sometimes I kind of zone out and forget where I am at times, I get stuck inside my head reliving those horrible days over and over, sometimes I completely lose touch with reality and feel like I really am in that memory. I don’t snap out of it until someone tries to talk to me or I start screaming. When I feel something like that coming on and feel myself start to get upset, I take a deep breath, get the lotion and try to focus on the mundane movements of putting it on. The lotion itself has a pleasant orange scent; at least to me it smells like oranges. Not entirely sure what ingredient it comes from either but it does smell good. I also have insomnia, putting this lotion has become a like a nightly ritual to help me get ready to go to bed. I in general apply Qi of Calm about three or so times a day, depending on the day. But it’s usually applied after my shower, before my afternoon nap and before I go to bed. Then I use it here and there when I need to keep my anxiety in check. 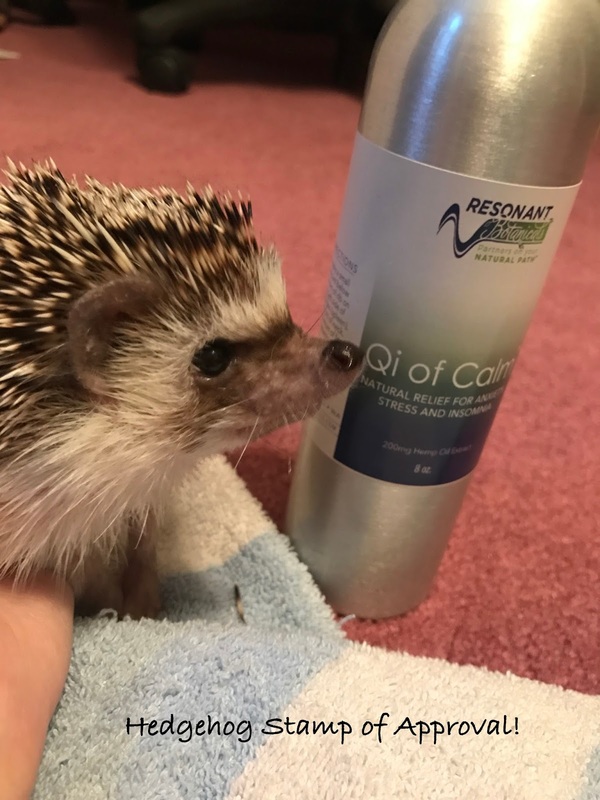 I also discovered that my pet hedgehog Stitch loves the smell of the lotion. I was holding him one afternoon after I had taken my shower and applied the lotion. I was holding him against my chest because he likes to hear my heartbeat and he slowly inched his way up my chest and started licking the front of my neck, which was funny and cute. All my pets are weird but I wouldn’t have it any other way. So Qi of Calm is officially the first ever recipient of the Hedgehog Stamp of Approval! Overall I think this product has helped me and I will continue to use this product in combination with other things I do to help with my anxiety. And again I like it more because it helps with my psoriasis on my hands. It’s a pleasant smelling product so you don’t need to internally stress out that you may smell odd. Animals seem to like the smell of it too; so don’t be surprised if your animal licks your hand or something.